We’d love your help. Let us know what’s wrong with this preview of Sir Princess Petra by Diane Mae Robinson. Book #1 in the Ten-Time International Winning Fantasy Series For Kids. Join Sir Princess Petra and her funny dragon steed, Snarls, on their zany adventures in this humorous fantasy series for kids . These multi-award winning dragon stories for kids 7 - 11 years are sure to entertain. “I have thought hard and for many passing moons. Jewels, frocks of lace, and princess games Book #1 in the Ten-Time International Winning Fantasy Series For Kids. To ask other readers questions about Sir Princess Petra, please sign up. Here begins the tale of Petra on the Ninth day of the Ninth month of her Ninth year. She announces to her parents, the king and queen of Pen Pieyu that she wants to be a knight. They consult the royal rule book and much to her parents dismay, they cannot find a reason that Petra cannot be a knight. But knighthood doesn't come easy, just because you are a princess. Petra must face one of three challenges, like every other knight to prove her mettle. She must capture a croc, silence a dragon or eat a Here begins the tale of Petra on the Ninth day of the Ninth month of her Ninth year. She announces to her parents, the king and queen of Pen Pieyu that she wants to be a knight. She must capture a croc, silence a dragon or eat a room full of raw onions. Petra ponders and decides on the dragon. Off she goes outfitted in kitchen pots and pans for she is too small for knightly armour. Petra learns the tongue in fact may be mightier than the sword, or in her case more of a kitchen knife. She silences the dragon, not with knives but with a kind deed and a new friendship is formed. She returns to the castle and decides that the dragon will become her royal steed, but things don't come so easily. Petra must overcome a nasty bogwitch, outwit Prince Nastybun and brave Hobble Wobble creek to get her royal steed home. How does she do it, well you will just have to read the book, he he. This was a delightful read, with a wonderfully strong female who isn't afraid to shirk the princess stereotypes to become a knight. She is thoughtful and helpful and always willing to find a better way. I love the innocence of her character and the message she portrays through her actions. The language and reading level are great for a read loud or for children just approaching independent reading of chapter books. The simple pencil illustrations were excellent. They made me fall in love with Petra and her kingdom from the moment I opened the book. I am thoroughly looking forward to the next book. Petra is the Princess of Pen Pieyu. It is September ninth, Petra’s ninth bi Princess Petra’s birthday request sends the court into a frenzy, but when she agrees to undertake a knight’s quest they can’t stop her. Armed with a cake knife and outfitted in the best royal pots and pans, Petra sets off to face a dragon and win her real armor before encountering a bog witch, and an army of the kingdom’s worst enemies. Will Petra’s kindness and acceptance prove to be more valuable than weapons and armor? Sir Princess Petra is one of those stories that will appeal to most everyone. It is charmingly funny. Petra sets out to prove she has what it takes to be a royal knight and proves she can do nearly anything. Snarls, the howling dragon, is endearing and lovable. If stuffed, sitting on a toy store shelf, every kid would want him. The story is short enough to be read in one sitting, say at bedtime. There are many opportunities for humorous, wacky, high-pitched voices, making Sir Princess Petra fun to read aloud. The author’s imagination is appropriately childlike. Petra is a child every parent will love. I know a child would have sweet, funny dreams after hearing mom or dad read this at bedtime. The illustrations are pencils drawings with wonderful shading and highlights. Petra is a strong character, yet the artist renders her sweetly, catching the child’s emotions perfectly. Snarls, the nasty, horrifying, dangerous dragon Petra sets out to conquer, looks the part until Petra sways him with her charms, and then helps him escape a predicament no one could expect. It is just one plot twist, which will entertain and amuse the reader. I hope Ms. Robinson continues her Pen Pieyo adventures. As the story opens, we meet Princess Petra who is about to celebrate her birthday on the ninth day of the ninth month on the ninth year. According to royal custom, she may request anything she wishes as a birthday gift. Petra addresses her parents and informs them that she is tired of the usual gifts of jewelry and clothes. This year she wants to become a royal knight. Her father, King Longstride cannot find anything disallowing her request in the royal rulebook. However, she must choose and suc As the story opens, we meet Princess Petra who is about to celebrate her birthday on the ninth day of the ninth month on the ninth year. According to royal custom, she may request anything she wishes as a birthday gift. Petra addresses her parents and informs them that she is tired of the usual gifts of jewelry and clothes. This year she wants to become a royal knight. Her father, King Longstride cannot find anything disallowing her request in the royal rulebook. However, she must choose and successfully accomplish one of three acts of royal bravery: capture a crocodile and make his skin into a royal leather chair, quiet the howling dragon named Snarls who lives in the Forest of Doom, or eat a roomful of raw onions! The princess dislikes onions and is friendly with the kingdom’s crocodile, so she quickly decides on quieting the dragon. Princess Petra departs the castle in a suit of armor made of pots and pans because all the royal armor is too big for her. Her weapon looks more like a cake knife than a sword. The poor princess soon meets adversity. During her adventures, she must figure out how to stop the dragon from howling and keeping the royal family awake, cope with a witch in the bog, and deal with an army of knights from a neighboring kingdom who want to challenge her. This princess has brains and common sense along with her beauty. She does not win her battles with force and bullying; Petra is a good judge of character and human nature! (even if some of those characters are not technically human) She has a wonderful sense of humor and can turn adversity into advantage. A Tale to Amuse, Intrigue, and Inspire . . . Petra is princess of the Land of Pen Pieyu, and on the ninth day of the ninth month of the ninth year, her birthday, she is granted by Royal decree that she may have whatever she wants. To the king’s amazement, her father, his precious daughter says she wants to be a knight! Thus begins a charming tale of a quest by Petra into the Forest of Doom, carrying onions for protection, and wearing her armor made of pots, pans, and a sword that resembles a cak A Tale to Amuse, Intrigue, and Inspire . . . Petra is princess of the Land of Pen Pieyu, and on the ninth day of the ninth month of the ninth year, her birthday, she is granted by Royal decree that she may have whatever she wants. To the king’s amazement, her father, his precious daughter says she wants to be a knight! Thus begins a charming tale of a quest by Petra into the Forest of Doom, carrying onions for protection, and wearing her armor made of pots, pans, and a sword that resembles a cake knife. She reveals that to be a knight, one need not be “brave, mean, and nasty” as she confronts Snarls, the terrible dragon. Then she is confronted by invaders led by Prince Nastybun from the kingdom of Mesoggie, who Petra subdues with a delightful highland-huggy-dance! Those are a few highlights of this compelling, charming, amusing and delightful tale of a brave young girl. Petra knows what she wants and uses kindness, grace, courage, and invention to lead her little band to glory. This treasured tale of discovery and determination, with charming illustrations, is ideal for any child. It will amuse, intrigue, and inspire. Plus, it will leave you wanting more . . . Sir Princess Petra adventures! This children's book is fun and exciting! It teaches to be kind, overcome obstacles and be yourself. It teaches friendship in the face adversity as well. Robinson has created a wonderful little world with a brave young girl. Well written with great descriptive writing and just pure fun! Well written, great for ages 5 to 12. Kids will really get into this story as they will be able to relate - each one trying to find themselves and here Petra knows who she is and what she wants to be, just only sh This children's book is fun and exciting! It teaches to be kind, overcome obstacles and be yourself. It teaches friendship in the face adversity as well. Robinson has created a wonderful little world with a brave young girl. Well written with great descriptive writing and just pure fun! This is a book for children ages 7-11 that deals with bravery, accomplishment, understanding and the acceptance of others. The author's sense of humour and story writing ability portrays good lessons for children to follow through the adventures of very creative characters. Such a fun story! I actually read book three first but that took nothing away from enjoying this first book in the series. Sir Princess Petra is a kind-hearted soul who has big dreams for herself to be a royal knight against her parents wishes. She goes on her quest and makes friend of everyone she meets. Such a great story with a good lesson and plenty of humor thrown in! Good but why so short? Although this may seem to be a children's book first, it is one of the few children's books that does not treat the reader like a young dolt. You won't find anything 'childish' here so that even adults like me can enjoy the story. In fact the book has a feminist overtone, with I like. Petra is not just any other princess; she is a symbol of the voice of protest against the existing patriarchy (and as if to prove her point she actually chooses the most dangerous of all tasks Good but why so short?
" “You are a princess … a girl. You must be big and brave and mean and nasty to be a royal"
Of course one does not need to be 'mean and nasty' to become a knight; that is presumptuous. This story teaches you that girls too can do just about anything that only boys are expected to do! A lot of the societal restrictions we find ourselves in today are not mentioned in any law book either; we humans, being creatures of habit, learn faster to adapt to existing rules rather than challenge them; if only more of us challenged those artificial restrictions like Petra did, the world would have been much more interesting and peaceful indeed. Very impressed. As a side note, I did not know about this first book in the series so the "first book" I actually read was the second book in the series. I was so impressed with the story that I wanted to grab the prequel too. Although the story in the prequel is just as exciting (probably even more) as the second book, I am just a little disappointed with its short length. I wish I had more to read! Compassion is a cornerstone of what it means to be brave. “Where is it written that a girl cannot be a knight and protect her kingdom?” Princess Petra demands to know. Nowhere at all, it is discovered. Nothing in the royal “rule book” prevents a girl from being brave, resourceful, and charting her own course in life. Of course in fantasy (as well as in real life”) one must prove oneself worthy by committing an act of bravery before being proclaimed a Knight. Undaunted, Princess Petra sets out to Compassion is a cornerstone of what it means to be brave. “Where is it written that a girl cannot be a knight and protect her kingdom?” Princess Petra demands to know. Nowhere at all, it is discovered. Nothing in the royal “rule book” prevents a girl from being brave, resourceful, and charting her own course in life. Of course in fantasy (as well as in real life”) one must prove oneself worthy by committing an act of bravery before being proclaimed a Knight. Undaunted, Princess Petra sets out to fulfill her own birthday wish by heading into the Forest of Doom to hush a howling, nasty dragon named Snarls. Although she is protected by a makeshift suit of armor, a cake knife, and a bag of onions (which plays an essential role in the story) and vows to forcefully overtake the beast, what transpires is an amusing, multi-faceted adventure resulting in unexpected friendships and a bond between various characters who cannot overcome their own personal obstacles without assistance. But together they are strong, courageous and find that compassion is a cornerstone of what it means to be brave. At first I thought the story ended rather abruptly, but in the ensuing pages Robinson treats us with detailed character descriptions that make the stories even more meaningful, entertaining and engrossing. There are wonderful fun names that kids delight in (like Snarls Lotzapuf Doom, the dragon’s full name). And to top it off she gives us extensive synopses of Books 2 and 3. The author whets your appetite for more. You can’t read just one Sir Princess Petra adventure. No Sir. The Pen Pieyu Adventures are well on their way to becoming timeless classics, worthy of all the accolades and awards bestowed upon the author and her charming, lesson-filled stories. This was sent to me by the author in exchange for an honest review. This is quite a short story with chapters, and is perfect for independent readers. This will appeal to a range of children young to older. This is a story about Princess Petra and it is her birthday, her father, the King has told her she can have anything she likes. Princess Petra tells the King she wants to become a Royal Knight. After some resistance (as girls aren’t Knights!) the King tells the Princess that in order to becom This was sent to me by the author in exchange for an honest review. This is a story about Princess Petra and it is her birthday, her father, the King has told her she can have anything she likes. Princess Petra tells the King she wants to become a Royal Knight. After some resistance (as girls aren’t Knights!) the King tells the Princess that in order to become a Knight she has to choose a challenge to complete. The Princess decided that she will hush the howling dragon as she doesn’t fancy any other the other challenges and takes a bag of onions with her. This is a story of journey and forming unlikely friendships with others. The Princess sees the dragon and witch as genuine people and not as others look upon them. She helps them and forms friendships with them. This also is a story of achievement and belief in yourself. Just because Petra is a girl this does not stop her from doing what is seen as a boy’s job. This is a powerful message to children and encourages them to follow what they believe in. The illustrations are nice, however I feel it would have been nice for these to be in colour for children who’s imagination is not as vivid as others. There are many words in the story that stimulate discussion for younger readers, which helps them to develop their vocabulary. I would like to thank the author for sending me this and look forward to reading her next. Sir Princess Petra is a cute story for elementary school girls that will entertain them to no end. It is a well-presented and written chapter book that will delight kids and their parents. Sir Princess Petra has nice drawings that will help your brain enjoy the tale more fully. I enjoyed the story and the fine work done by the author. This book is part of a new well-crafted series to collect and read with your children. Petra is a princess and her father is going to grant her a wish. She thinks a Sir Princess Petra is a cute story for elementary school girls that will entertain them to no end. It is a well-presented and written chapter book that will delight kids and their parents. Sir Princess Petra has nice drawings that will help your brain enjoy the tale more fully. I enjoyed the story and the fine work done by the author. This book is part of a new well-crafted series to collect and read with your children. Petra is a princess and her father is going to grant her a wish. She thinks and thinks until she finds her perfect desire. Petra would like to become a trusted and brave knight. Her parents try to persuade her to change her mind, but she does not. Even the book of rules can’t stop her from becoming the first princess knight in their kingdom. So, she goes on her quest alone, armed with a knife and a sack of onions. Her armor is made of pots and pans, because nothing in the royal armory fits her. Yet, she is brave and bold even after the hawks, bees, and dragons try to chase her back home. No, not even the crocodile can divert her from her path to knighthood. The Pen Pieyu Adventures, of which Sir Princess Petra is one of the books, will provide hours of good, clean reading for your elementary school children. It is well done, nicely written to their age level. I would recommend it for elementary school children, their teachers, and parents alike. Well done. Your children will love this book. Petra is a princess – but not just an ordinary princess. Petra has ambition. Bored with her usual gifts of frocks and jewellery, when her birthday comes around and she can choose what she wants, Petra decides she wants to be a Royal Knight. Her astounded parents turn in hope to the royal rulebook to find a way out of this dilemma. But alas, there is no rule that says she can’t be a Knight. Hoping to discourage her, her father tells her of the challenges she must Your children will love this book. Hoping to discourage her, her father tells her of the challenges she must face to achieve her lofty ambition. To his utter amazement, she decides that she would rather hush the howling dragon in the Forest of Doom than one of the other alternatives - eat a bag of onions. How Petra completes this deed and the events that follow will have the reader laughing and cringing in turn. Sir Princess Petra is an enchanting, fun story that I’m sure children will love. But it is a fun story with a deep message. It is a story of belief in yourself, courage to face adversity to achieve what you want to be, and how kindness and understanding are better than brute force and fighting. The writing is lively and well executed and the illustrations are skilfully drawn and add to the story’s appeal. I will certainly be buying this book for my granddaughter. She will love it. My daughter (10) and I reviewed this book for our website, http://MotherDaughterBookReviews.com. She gave the book 4 stars and I (the Mom) gave it 5 stars. Here are excerpts from what we had to say. For the full review, visit us at our website. This book is about a princess who wants to be a knight. To become a knight, she has to get a dragon to be quiet. So she goes on her quest and ends up meeting the dragon, a witch, and a prince who wants a duel. She ends up making friends with My daughter (10) and I reviewed this book for our website, http://MotherDaughterBookReviews.com. She gave the book 4 stars and I (the Mom) gave it 5 stars. Here are excerpts from what we had to say. For the full review, visit us at our website. This book is about a princess who wants to be a knight. To become a knight, she has to get a dragon to be quiet. So she goes on her quest and ends up meeting the dragon, a witch, and a prince who wants a duel. She ends up making friends with all of them. I thought it was funny when Petra couldn’t fit into the armor, so she used pots and pans instead. I also liked that instead of fighting all of the enemies that she runs into, she makes friends with them. I loved this book and I recommend it to girls and maybe boys 11 and under. I really feel that this little book is a gem. It is a relatively short book that can easily be read aloud to children in one sitting. My kids and I were completely captivated by this fun, adventure-filled tale about a very charming and unorthodox princess. I highly recommend this book to families with children under the age of 10 and as young as 5 who love a good tale filled with fairy-tale characters such as dragons, witches, princesses, and knights. When it comes to fantasy novels directed at children, I am particularly impressed by authors who can achieve a memorable story that is palatable for young people, yet still shows an underlying skill of writing and awareness of deeper meanings. The possibility of using literature for such an admirable purpose is what writers should get into the business for, and Robinson has certainly done that. I think Sir Princess Petra is a wonderful new heroine for a new generation, a female who breaks down g When it comes to fantasy novels directed at children, I am particularly impressed by authors who can achieve a memorable story that is palatable for young people, yet still shows an underlying skill of writing and awareness of deeper meanings. The possibility of using literature for such an admirable purpose is what writers should get into the business for, and Robinson has certainly done that. I think Sir Princess Petra is a wonderful new heroine for a new generation, a female who breaks down gender roles and demonstrates self-confidence and pride in her passions. When Princess Petra’s royal birthday comes, granting her anything her heart desires, she wishes to become a royal knight. Her parents aren’t too happy and tell her girls can’t be knights…but there is no official rule to stop her. Petra has to complete a task to become a knight and the task was to hush the howling, nasty dragon that lives in the forest of DOOM (which might not be as easy as it sounds ). Yet Petra, full of confidence, sets off to face all the dangers that a knight will face. Bees, When Princess Petra’s royal birthday comes, granting her anything her heart desires, she wishes to become a royal knight. Her parents aren’t too happy and tell her girls can’t be knights…but there is no official rule to stop her. Petra has to complete a task to become a knight and the task was to hush the howling, nasty dragon that lives in the forest of DOOM (which might not be as easy as it sounds ). Yet Petra, full of confidence, sets off to face all the dangers that a knight will face. Bees, hawks, beastly bog rats and enemy knights can’t stop Petra, but can she hush the dragon? I liked this book because it has a great story line and a great message about believing in yourself. Petra proves that she and all girls can be daring, adventurous and brave. I think Petra was a great character and I liked Snarls (the dragon) even better because he had good sense and dragons are just cool. The book is a beginning chapter book so there isn’t a lot of details in it but it tells a complete story. The black and white illustrations in the book are really great too. The book is part of “The Pen Pieyu Adventures.” I hope that means there will be more books about Petra coming out! This book is an awesome beginning chapter book and a great read aloud. In this first book of the Pen Pieyu Adventures, we meet Princess Petra, a feisty young lady whose unusual birthday request to become a knight sends the royal court into a frenzy. The king tries desperately to talk her out of it, but when she agrees to undertake a knight’s quest, they can’t stop her. Full of silliness and hilarity, this book turns stereotypes about girls, dragons, and a few other things on their head and teaches children to give people the benefit of the doubt rather than believi In this first book of the Pen Pieyu Adventures, we meet Princess Petra, a feisty young lady whose unusual birthday request to become a knight sends the royal court into a frenzy. The king tries desperately to talk her out of it, but when she agrees to undertake a knight’s quest, they can’t stop her. Full of silliness and hilarity, this book turns stereotypes about girls, dragons, and a few other things on their head and teaches children to give people the benefit of the doubt rather than believing gossip about them. The books in this series are early chapter books, around 100 pages each, and are fun and suitable for children ages six and up. They move very quickly and are quite short, so I think they’d be particularly suitable for reluctant readers. I also think boys would enjoy these books as Sir Princess Petra thinks and behaves in the way I imagine most boys wish girls would think and behave – kind, down-to-earth, adventurous, and never squeamish or manipulative. Diane Mae Robinson tells a charming tale of Petra, the young Princess of Pen Pieyu, whose birthday wish is to be dubbed a royal knight of her father's kingdom. Although Petra takes her father, the king, by suprise with her curious royal birthday wish, Petra proves her bravery through a quest to hush the howling dragon. Sir Princess Petra ia a delightfully imaginative storytime read and re-read. Petra's character is both confident and charismatic. Her good nature conquers the friendship of Snarles, the dragon, and other characters in the Forest of Doom. Further, Robinson's empowering story is accompanied by beautiful shaded pencil drawings that illustrate Petra's royal quest. Both text and illustration combine to create a vivid story of courage and determination. I highly recommend Sir Princess Petra for school, public, and personal library collections. Robinson coins a tale that invites readers to accompany Petra on a fearless journey towards friendship and self-discovery. The Pen Pieyu Adventures - These are three beautiful books written by award-winning author Diane M. Robinson and illustrated by Samantha Kickingbird. Petra, on her birthday, asked to be a knight as her required act of bravery, she chose to 'hush that howling, nasty dragon, snarls, in the Forest of Doom'. And so the adventure begins. The books are page turners and the adventures stretch the imagination and the lessons are just around the next corner, or bog, or castle. Beautifully told with the l The Pen Pieyu Adventures - These are three beautiful books written by award-winning author Diane M. Robinson and illustrated by Samantha Kickingbird. Petra, on her birthday, asked to be a knight as her required act of bravery, she chose to 'hush that howling, nasty dragon, snarls, in the Forest of Doom'. And so the adventure begins. The books are page turners and the adventures stretch the imagination and the lessons are just around the next corner, or bog, or castle. Beautifully told with the language of a child and the wisdom of young adults, the author surprises with her wit and wonderful imagination. Adventures are plenty, excitements many, and the paths and journeys are so full of joy that one is hard-pressed to read and not allow a lazy smile to settle and remain on his or her lips. It's easy to see why this series had been awarded so many prizes and much praise. Highly recommend it. Sir Princess Petra - The Pen Pieyu Adventures by Diane Mae Robinson is about a charming story that teaches children that friendship and acceptance are often times your best weapon. Princess Petra is having a birthday and she has just one request, she wants to be knighted. Her parents are aghast, but Princess Petra stands her ground and reluctantly the King sends her on a quest. Outfitted with pots and pans and armed with a cake knife Petra sets out to hush the howling dragon. Will Petra succeed a Sir Princess Petra - The Pen Pieyu Adventures by Diane Mae Robinson is about a charming story that teaches children that friendship and acceptance are often times your best weapon. Princess Petra is having a birthday and she has just one request, she wants to be knighted. Her parents are aghast, but Princess Petra stands her ground and reluctantly the King sends her on a quest. Outfitted with pots and pans and armed with a cake knife Petra sets out to hush the howling dragon. Will Petra succeed and be knighted for her birthday? Follow the princess on her journey as she discovers that in order to be a knight she must defeat her enemies with kindness and she may even makes new friends along the way. Sir Princess Petra - The Pen Pieyu Adventures is a tale full of adventure and humor with a charismatic main character who has a lot of heart. You shouldn’t judge a book by its cover, but it doesn’t hurt that Sir Princess Petra has a great one. A delightful story, it chronicles the adventures of a young princess become knight in shining armour. It’s everything you would want in a book: cute, funny, and with great messages. The adorable illustrations will serve as your companions as you eagerly flip the pages. Robinson was honored with two major awards for the first work in the children's book series, Sir Princess Petra. She was awarded You shouldn’t judge a book by its cover, but it doesn’t hurt that Sir Princess Petra has a great one. A delightful story, it chronicles the adventures of a young princess become knight in shining armour. It’s everything you would want in a book: cute, funny, and with great messages. The adorable illustrations will serve as your companions as you eagerly flip the pages. Robinson was honored with two major awards for the first work in the children's book series, Sir Princess Petra. She was awarded the Lieutenant Governor of Alberta Emerging Artists Award for Children's Book Author and took 2nd place in the Purple Dragonfly Book awards for Children's Chapter Book. Sir Princess Petra is about a young girl who requests to become a knight and her father says she must complete one brave task in order to be dubbed a knight. This is her story about the journey she goes on to become a knight! This was such a cute book!!! I absolutely feel in love with Sir Princess Petra as a character! She was funny, brave and definitely went against the general consensus of who a Princess is and how she should act!! I only wish that the relationship between Sir Princess Petra a Sir Princess Petra is about a young girl who requests to become a knight and her father says she must complete one brave task in order to be dubbed a knight. This is her story about the journey she goes on to become a knight! What a wonderful story. You don't get many books that can teach qualities such as, respect, friendship and trust. This book does that simply by showing through a lovely story. Any child will love this. It's funny, innocent, charming and has some great pencil drawings to help the reader or listener to visualise what is happening. The author has a great gift at story telling, without telling you how or what you should do to learn the skills that the the story teaches. The main character of the book, What a wonderful story. You don't get many books that can teach qualities such as, respect, friendship and trust. This book does that simply by showing through a lovely story. The author has a great gift at story telling, without telling you how or what you should do to learn the skills that the the story teaches. The main character of the book, Petra, shows you what to do when she is placed in certain situations which require her to use her head and not her makeshift sword. We can all learn something from this story. If you have a child or have children, I encourage you to get a copy of this book and read it to them. I hope there are many more Petra adventures in the future. 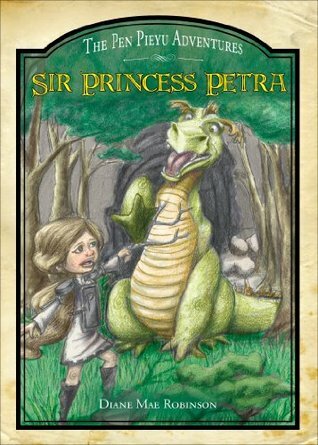 Sir Princess Petra is the first of The Pen Pieyu Adventures and it's my favorite, maybe because I'd already read the next two books and I learned in this one how she became friends with the dragon, Snarls, and the bog witch, Bograt. Such a fun book to read! On he Sir Princess Petra is the first of The Pen Pieyu Adventures and it's my favorite, maybe because I'd already read the next two books and I learned in this one how she became friends with the dragon, Snarls, and the bog witch, Bograt. Such a fun book to read! On her adventures, she learns that you don't have to be mean and nasty to be a brave knight. She also turns potential enemies into friend. She is a special princess, for sure. When is a Princess NOT a Princess - when she doesn't have a Talent - or at least a Certificate for a Talent. In this delightful little tale we learn how Princess Petra becomes a Knight and how she gets her Talent certified. A great story for entertaining for kids AND educational without them knowing it! Sir Princess Petra is a wonderful children’s book written by Diane Mae Robinson. A strange desire of Princess Petra turns into an exciting and funny adventure, which will make happy any child. The book is accompanied by awesome illustrations. 4 stars is only because I thought the illustrations should be in color. I decided to read this series, this book being book one, after reading about all the awards the series has won--I believe seven awards which is a lot by my standards. There's a certain innocent charm to the story of Princess Petra and her quest to become a knight. Petra is a great heroine for young girls, and boys, to follow. She's adventurous, a true-blue friend, she takes each strange situation in stride, and she solves problems with her loving nature. The author's writing is vivid and strong. H I decided to read this series, this book being book one, after reading about all the awards the series has won--I believe seven awards which is a lot by my standards. The author's writing is vivid and strong. Highly recommended. I had high anticipation from this book just from the picture on the cover...it was more than met! The whimsy of the story, the can do attitude of Princess Petra, regardless of the challenge. I thoroughly enjoyed reading this book and can't wait to share it with my grandchildren, who are avid readers. The illustrations were adorable. What a great read for a child. The Princess Petra books are full of adventure and fun. They are chapter books for young readers and have wonderful illustrations throughout the stories. The books follow Princess Petra as she strives to follow her heart and be who she is. With a charming cast of characters, the Princess Petra stories will delight anyone who reads them. I had a lot of fun reading these books! I loved this story because the girl was breaking stereotypes, overcoming her fears and not judging a book by it's cover :), in a fun way that kids will get. Sir Princess Petra an enjoyable read for kids with a few good lessons woven into the story. Diane Mae Robinson is an international multi-award-winning author with 14 international book awards and 1 prestigious provincial book award. Diane writes children's fantasy/adventures and children/teen non-fiction. The author's latest release, The Dragon Grammar Book, is an Amazon Bestseller in Teens/Language Arts. Diane is also an artist, art teacher, writing instructor, international short story Diane Mae Robinson is an international multi-award-winning author with 14 international book awards and 1 prestigious provincial book award. Diane writes children's fantasy/adventures and children/teen non-fiction. The author's latest release, The Dragon Grammar Book, is an Amazon Bestseller in Teens/Language Arts. Diane is also an artist, art teacher, writing instructor, international short story contest judge, and children's book editor.